Today, we caught up with our friends at Addgene, a Cambridge, Massachusetts - based non-profit that helps scientists share plasmid research. After two weeks, they finally had to throw out the silver spray-painted boxes, old computer parts, random gadgets and homemade silver caps that were lying around their office. “It was hard to part with them…emotionally,” lamented Laura Veckerelli, a member of the office support team. 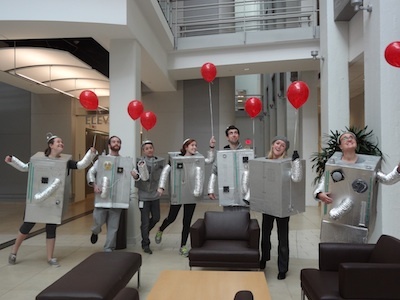 Laura is referring to her seven-person team’s entry into Addgene’s Annual Halloween Costume Contest, a ten year old tradition. It all started in a conference room, with Laura’s team brainstorming what to wear. That is – until an unlikely source inspired them. 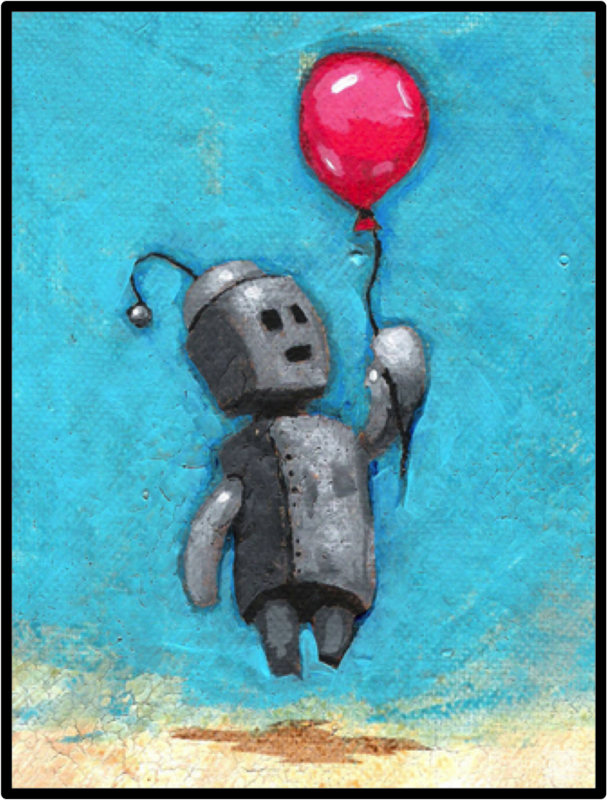 A cute little robot with a red balloon. “It was one of those ‘Oh my God, YES!’ moments,” Laura explained. The team agreed emphatically and began to carefully map out a plan to find everything they’d need. The folks at Addgene knew they had to do Craig’s robot justice, so they worked hard, making sure they got the costume just right. Armed with craft supplies and snacks, the team worked together into the night to shape and spray paint each robot’s boxy torso. Then, they added their own flair by pasting on accessories of their choosing including tubes, dials and switches. “It was such a wonderful team-building experience and everything was going great until – someone exclaimed ‘We need the hat with the pom-pom!” The team immediately went out searching for just the right materials to build a hat that would make Craig’s robot proud. The Annual Costume Contest is Addgene’s favorite company event of the year, among cooking contests, ice skating outings in the winter, kayaking in the summer and brewery tours. Having different parts of the team come together to create something special has a huge impact on their overall culture and is further emphasized by a healthy competitive spirit. 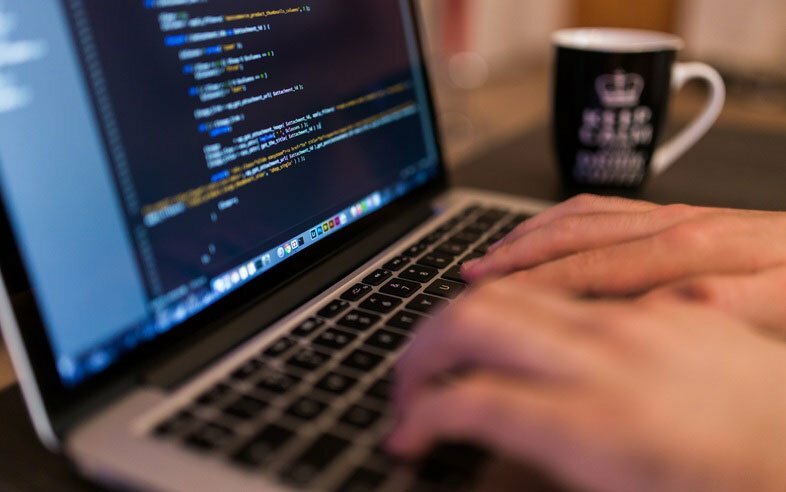 “It was especially great because a member of our UK office was in town for the event and they joined our team. I think having them connect with an element of our office that’s so dear to us really helped them understand the culture at our headquarters – despite being overseas,” Laura told us. Over the course of ten years, Addgene has grown from three to fifty employees, ranging from scientists to lab researchers to office support staff, but one thing that hasn’t changed is the culture of the organization. Laura told us that the culture and group atmosphere at Addgene is the best part about working there and has led to exceptional retention. But - to keep the culture moving forward, they need to consistently reinvent themselves with new ideas and new sources of inspiration. 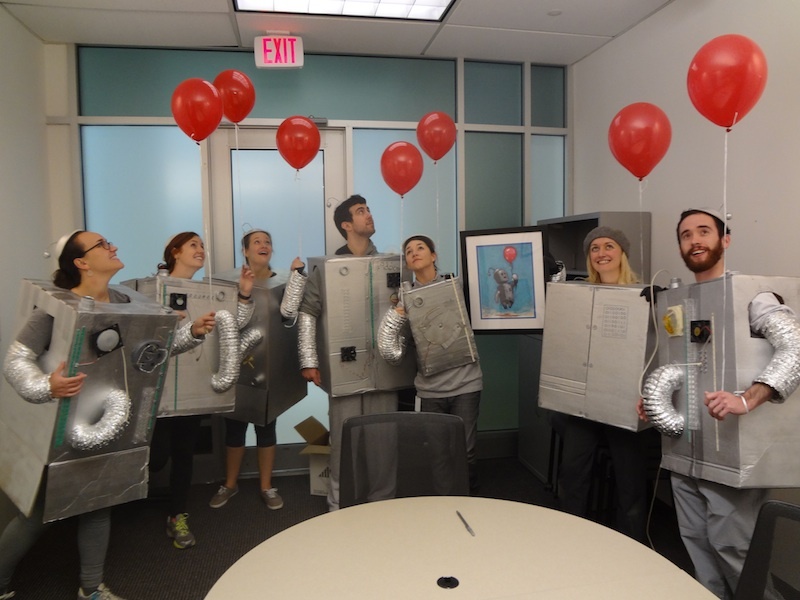 When we learned about Laura’s team and their choice of Craig’s “Robot with Balloon” as a costume idea, we were overjoyed. To see artwork truly and uniquely impact the way a company comes together has been our mission all along. Now – we’ll be prepared to challenge our friends at Addgene next Halloween, but in the meantime, we’ll be thinking of new ways that we can help your company have fun with art! 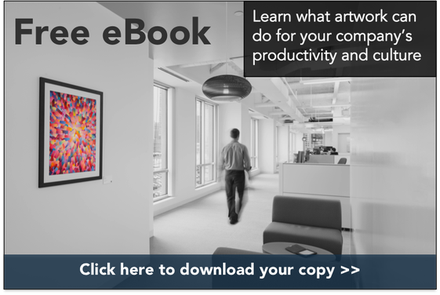 Also, if you're interested in learning more about how you can get artwork into your office, click the button below!